OLDRIGHTIE: The Theft Goes On. Olympic Shield For The Real Goings On. I rather enjoy the Parliamentary recesses. Not least how little we miss their posturing and useless gatherings. I'm also very glad these Olympic games have begun. The actual sporting events tend to be a blessed relief from the never-ending hype and smug rip offs, paraded as some kind of wonderful benefit to us all. One fact does emerge from the whole rather disappointing business. 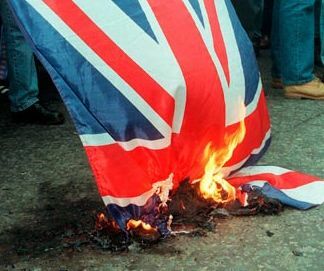 The reality of our lives and our now fractured United Kingdom. A break up set in motion by Bliar, in an attempt to LIBOR votes and seats. Behind those secretive and hidden schemes are the lies, manipulation of money and power for the few, at the wretched expense of the many. We all know these Olympics will have enriched many via nefarious deals and unpleasantly nurtured patronage. Lord Smug (Coe) must have enhanced his bank balances many times over but pale into insignificance compared to some of the Tessa Jowell like Italian interests! I also suspect Labour did not forecast that the final pay outs would go right rather than left! So enjoy the sport and the competition by all means. You are paying through the nose to fund it all, just as you have all the other scams and pickpocket goings on. All I ask is don;t lose sight of the unpleasantness that is ever present, where vast sums are to be filched by those trained to see an opportunity and exposed, trusting pocket. The high class whoring for the VIPs will be doing very nicely.As will the Dorchester clandestine poker games with the World's GDP earnings on the backs of the exploited. Don't lose track of the LIBOR manipulation either. In that particular scam more pockets were picked than in all the world's cities combined. Unlike the more naive "experts" this blog smelt a rat the moment the word "manipulation" appeared. What can be pushed down can also be sent up. Yale economic academics seem to get it. I quote, "More nefariously, banks also manipulated Libor to make money or avoid losses on their trading portfolios. For example, when U.S. traders at Barclays wanted Libor to rise in order to draw a bigger profit on some of their financial products, they simply asked their colleagues at the rate-setting desk in London to push the numbers up or down to suit their needs. Barclays would then submit artificial bids and persuade their counterparts at other banks to do the same." So watch out for the low flying summer issues and the attempted camouflages. Particularly Casty's (Cast Iron Dave) continued trips to visit and share private moments with Bliar, The Bilderberger yacht gatherings and The EU bunga bunga get togethers. Me, I'm hoping for American legal proceedings to use their superior bite to our pygmies in Government and go big time after the rate and currency manipulators. You see there could be a reversal of the sub-prime victims here. Those forced out of their homes by the Wall Street and European "fixers" could be compensated. Money flow back to those whose pockets were picked. Then this new found economic freedom could genuinely help economies to recover.We all know most sensible individuals spend more wisely and cautiously than Governments and Bankers! Luckily on Sky it is possible to pick up a range of international news channels and on the web to keep track of what is going on elsewhere. What is scary is that in the UK, those relying on MSM will be left blissfully unware of some of the very worrying things that are in play. You are quite correct, Demetrius and it will, hopefully, continue the weakening of the BBC's propaganda brief from Government, of whichever hue. Yes, plenty of the bread and circuses approach for the plebs over the next few weeks whilst rather more important 'business' carries on behind the scenes. What did you make of the opening ceremony itself OR? It certainly left me and many others feeling distinctly queasy. Yet another celebration of the nation's demographic demise and replacement. Hi, Durotrigan, many thanks for the comments. I was out until late and on my return tuned in. I saw presented the multi-cultural propaganda writ large and the hint of smug victory of socialism over common sense and national pride. There was the odd glimpse of how we used to be a decent and good Country but the dominant theme seemed to be that the Left and their EU Government have us by the balls. Sad and unnecessary. After all I've still to here the warble of a rotund soprano finale. Usually tune in to Russia Today for unbiased news (ponder a mo on the improbability of that remark..) but of late the signal has become very unreliable. I reckon darkness is afoot! At least I can still tune in online ... for the time being. Check out your aerial, we were having a few problems like this. There are several potential factors. One is that mesh aerials supplied several years ago were not that good in quality and corrode, also in the connections. "There is so much good in this world - I refuse to be hoodwinked by the buggers :-)"
Indeed, Caratacus but we must help others to avoid being hoodwinked, too. By the way, mice love chewing aerial cables, worth a look! If being a crook and thief were a sport, all those jerks would get gold medals! Yes, record numbers of them, AB.